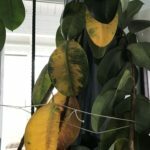 How do you separate or cut to smaller size a rubber tree plant? My tree is getting too big and I would like to separate it or cut it down a little to make another tree. How can I do this without damaging the tree?